Attached to the LC Walker Arena is one of the most fun tequila and taco bars I have EVER been to. 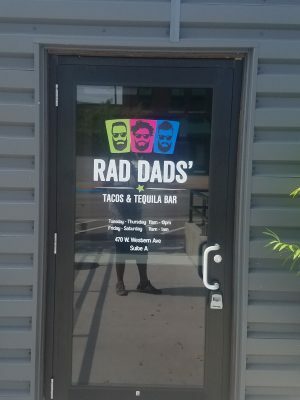 Rad Dads’ is the spot and the first place you need to stop in Muskegon, Michigan. 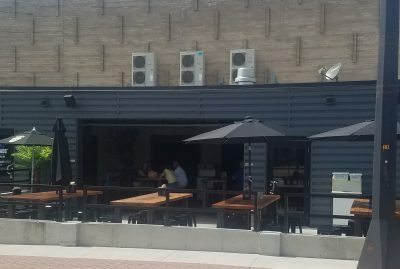 At first I thougth this place was a restaurant only in the hockey rink but I was corrected and they are just attached to the same building With huge garage doors that open for a very warm and fun feel I knew I was going to enjoy my day. While most of the time I go to places for the food I was craving a margarita and that was my priority. 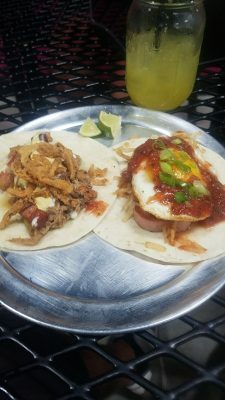 I looked over their menu and ordered their Weekly Taco Feature(WTF) which was called A Hangover Taco, A Dictator, and A Cubano Taco. I got a house Margarita to wash it all down. 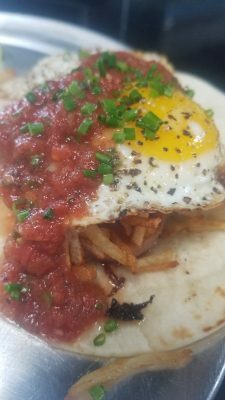 The Hangover taco was a spam and hash-brown taco with a scallions, a fire-roasted salsa and a runny egg on top all in a flour tortilla. It was beyond wonderful and reminded me of breakfast with my dad in taco form. The margarita was perfect. Not to sour, not to sweet with a wonderful taste of tequila in the finish. 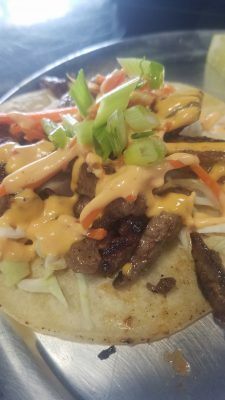 The Dictator is a Korean marinated bulgogi steak, cabbage, pickled carrots, scallions and sriracha aioli in a corn tortilla. The meat was marinated and cooked perfectly and the mix of meat with slaw and sriracha aioli had a little heat to it but what Korean dish doesn’t. The Cubano was a kaluha pork, Swiss cheese, pickles, fried pork belly, spicy mustard aioli and crispy onions in a flour tortilla. 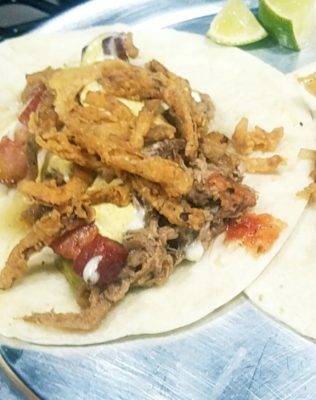 The crispy pork belly and onions made a wonderful crunch to a very tasty taco. The pickles and mustard aioli was a twist that I have never seen before in a taco but I did not mind it one bit. 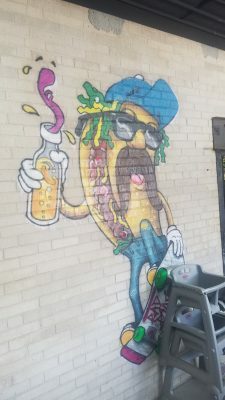 Next time I stop in I will try to come on a Sunday for brunch and get me a Tequila-Sunrise Mimosa or Bloody Maria and some of their brunch options.